If I hadn’t been encouraged to take a Health Check in my mid THIRTIES I could already have Diabetes by now. Cest la vie some say. There are natural ways of improving your health, lowering your glucose levels, lowering your cholesterol and better managing your insulin. If I can do it, so can you. I hope my free report inspires you to give it a go. An article printed in the Daily Express. For the full article click this link. 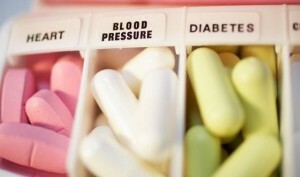 Since improving my own health through being accountable to a strategy for healthful eating, regular activity, continuous learning and healthy mind management I am a great believer that you can reduce or eliminate the need for statins or oral anti-diabetes drugs if you reduce your waist size, clean up your body from the inside and maintain a stress free lifestyle. There are plenty of people who have written books about the science backing up the claims that you can improve your health, get off statins or avoid diabetes through lifestyle changes. See this Cholesterol article for some of those books. My own practical experiences prove that you can increase HDL, lower LDL, lower body fat, improve blood pressure readings and improve health in general, removing the need for taking medication and significantly lowering the risk of heart attacks and strokes. Please do a bit of your own research, try and upgrade your lifestyle and lose some body fat and see where it gets you. Best of luck. Don’t forget to download my free report. There is no charge and no email opt-in. I wrote it for you and hope it helps.